Riverside Football had a great 2015 season making it all the way to the Dome. The team really had some talented players that did a great job leading the team. LB Evan Veron was a tackling machine who made plays on the defensive side of the ball every game. If you saw this kid play one game, you knew instantly he was one of the best in state. Check out Evan in today's Recruit Interview. Winnfield Football had a great year getting 7 wins on the season (one of those against South Beauregard in the playoffs). Many players on the team were talented athletes and great leaders. Meet one of those kids today in our interview with DE Parker Brewerton. Bishop George is an underrated QB who plays for Loyola Prep High School. The Flyers have had some special athletes come through their program and Bishop falls into that category. This kid is a good athlete with a big arm. The Senior is also an outstanding leader on and off the field. Meet Bishop in today's 20 Questions. Dutchtown’s Ricky Thomas isn’t your typical 5’10, 177 pound Cornerback. Corners of his size are known for their speed and athleticism that suits their duties of covering speedy wide receivers, not for their physicality in the run game. Learn about this recruit in this article written by Nick Scelfo! QB Torez Kinchen is a player high school football fans need to go see play this season. 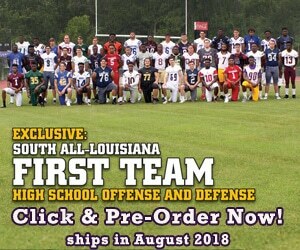 He leads one of the best team's Denham Springs has put together in a long time. Kinchen is a good athlete with a great arm. He will be playing at the next level a year from now. Our reporter Nick Scelfo got to interview the Yellow Jacket QB the other day. Meet Torez Kinchen in today's interview! Matthew Beck is one of the more underrated QBs in the state of Louisiana. This is a big, pocket style QB with a rocket arm. Opponents need to watch out for Beck this season along with the rest of ASH's team. Meet Beck in today's 20 questions! Today's article is with QB Ian Brian from Catholic High School. Ian is an underrated QB who started for the first time last season. He has a solid arm, good feet, and is a very good athlete. Our writer Katherine Smith asked Ian some question to get to know the Catholic High Recruit this past week. Learn about Ian Brian in today's article! After wrapping up the 2014 season, Joe Coats is saying goodbye to coaching.With Coats retirement, he will be putting down the pen on his 42-year coaching career as one of northeast Louisiana’s premier defensive strategists. Although Coats spent many years coaching at Neville, the school played a bigger part in his life than just his coaching career. Read about it in today's story! Thursday morning was a sad day across Louisiana after losing a special person in the football world. Billy Laird had an outstanding football career as both a player and a coach. The former LA Tech QB was a mentor to hundreds of young men who are now grown today. Anyone will tell you what a loving and caring family man he was as well. The man was a legend and his legacy will carry on.